Private transfer from Keflavík international airport to Hotel Rangá in South Iceland, where you stay 3 nights at luxury country hotel Rangá in Hella, South Iceland. Daily breakfast buffet included. 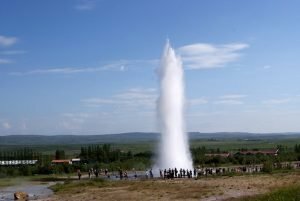 Value-added activity: Depending on arrival time additional sightseeing could be done, especially on the western edge of the Reykjanes Peninsula. Today, we head along the south coast and reach the area near the active volcano that is beneath the Eyjafjallajökull glacier. We stop at the high but narrow Seljalandsfoss waterfall, which plunges from the mountain. Next, we visit Skógar folk museums, which contains an outstanding collection of farm and domestic artefacts from Iceland’s past and several turf-built houses. Nearby is one of the most impressive waterfalls in the country; the 60-meter high Skógafoss waterfall. Then the tour continues further south where you can stroll on the black lava beach to see the amazing bird cliffs at Reynisfjara near Vík. If you travel at the beginning of April, you might have the chance to see the mystical northern lights. Included choice of activities: 2-hour round-trip walk to the epic plane wreck on the black beach or glacier hike on Solheimajokull glacier or snowmobile tour on Myrdalsjokull glacier. Included choice of activities: Hiking or a visit to a horse farm and geothermal greenhouse. We travel to the charming fishing village of Eyrarbakki with a large number of preserved houses from the period 1890-1920, and therefore a visit is like a journey 100 years back in time. We continue through lava fields and coastal landscape to Strandarkirkja, a Lutheran parish church on the southern coast of Iceland. This small, beautiful wooden church, has been a beacon for those travelling at sea and is often referred to as the “miracle church” with the locals’ longstanding belief that it has profound, divine powers. Next, we explore the Reykjanes Peninsula with its hot springs, mountains, bird cliffs, lunar landscapes and fishing villages. Krýsuvík is an area with solfataras, fumaroles, mud pots and hot springs. The soil is coloured bright yellow, red and green. In the afternoon we warm up in the geothermal mineral-rich waters of the famous Blue Lagoon. Once we reach Reykjavík, we show the highlights of Iceland’s capital and visit the Pearl, enjoy the panoramic view from the observation deck and walk through a man-made ice cave in the middle of the city. Overnight and breakfast at a 4-star hotel in Reykjavik (Grand Hotel, Hilton, Fosshotel Reykjavik or similar).